Jules Didier was a French landscape and genre painter whose work was steeped in the academic tradition of landscape painting. At the same time, he showed diverse interests in both media and theme, executing paintings, lithographs, and watercolors showing landscape, mythological, biblical, and animalier themes. Jules Didier was born May 26, 1831 in Paris. He entered the École des Beaux-Arts in April of 1852 and began studies under Léon Cogniet, an established academic artist who worked as a portraitist and landscapist. 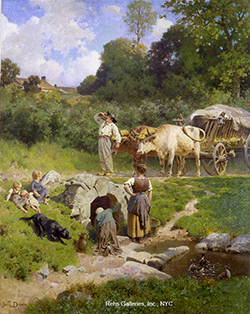 He was also a student of Jules Laurens, another landscape artist and lithographer. Didier debuted at the 1853 Salon, exhibiting a lithograph entitled Le Lithographe; étude (The Lithograph; study). The mid nineteenth century ushered in a new period of appreciation for printed works. Artists began to reevaluate the hierarchy of the arts, which had to that point placed painting at the highest level, since prints were considered by many only suitable for preparatory sketches or for reproductive material destined for the masses. For Didier to begin his public career with a lithograph shows that Laurens must have been exerting on him. He was also influenced by Constant Troyon and Rosa Bonheur in their depiction of animals and executed two lithographs early in his Salon entries after their works. A definitive moment in Didier’s career presented itself in 1857 after submitting Jésus et la Samaritaine (Jesus and the Samaritan) to the Salon, for which he was honored with the Prix de Rome in the category of historical landscape painting. The Prix de Rome was issued to a young artist and came with the full graces of the Salon juries. In such a contentious artistic period, winning such a prize attested to your acceptance by the Salon jury and the continuance of the École des Beaux-Arts tradition and style. As all Prix de Rome recipients, Didier went to Rome for a period of four years. He returned from this trip with a mass of studies which would have a lasting influence on his work as many of his subsequent pictures featured Italian views. At the Salon of 1863 he exhibited Horace, Enfant, Retrouvé par des Bergers (The Young Horace Found by Shepherds). From this point he began exhibiting regularly at the Salons. In his early career Didier had shown an affinity with nature and animals, but after his time spent in Italy, he combined his two interests and executed many works that were based on the Italian landscape but which also included depictions of animals, such as Troupeau de Bœufs Romains, Passant un Gué dans la Campagne de Rome (Herd of Roman Bulls Crossing a Ford in the Roman countryside) for the Salon of 1864, Taureau Romain, Scène de la Campagne de Rome (Roman Bull, Scene in the Roman Countryside) for the Salon of 1873, among many other examples. Through the end of his Salon career he would continue to intermingle these themes of animals and landscapes based on Italy. Accolades continued to be bestowed upon Didier and his work. In 1866 he was given a medal for his Bords du lac Trasimène (Banks of Lake Trasimene) and Labourage sur les Ruines d’Ostie, Campagne de Rome (Plowing on the Ostian Ruins; Landscape of Rome) both from his period of study in Italy. Later, in 1869, he received a medal for Chiens Courants et Chien d’Arrêt (Beagles and Pointers) and Picadors Romains Conduisant des Boeufs; Campagne de Rome (Roman Picadors Herding the Bulls/Oxen). This submission also placed him “hors concours” which meant that he no longer had to submit his work for acceptance by the Salon jury and could exhibit at free will. As his work became better known, he also partook in more French exhibitions such as the Exposition Universelle in 1878 where he exhibited a large watercolor of almost four meters long, representing a birds eye views of Paris. Two years later he obtained a commission from the city of Paris for a series of decorative paintings for the École de la rue Château Landon, including another large frieze entitled Travaux Agricoles (Agrarian Work) which was also shown at the Exposition Universelle of 1889. Also found at the same pavilion was another long work, five meters in size, representing Cours de la Seine from a bird’s eye view. Didier continued to receive further state commissions. A most notable commission was that for the World’s Fair of 1893 in Chicago. He executed four paintings in 1892 including: Le Lac Daumesnil (Daumesnil Lake), Le Parc Montsouris (Montsouris Park); Les Champs Elysées; La Place de la Bastille. This commission was exceptionally important because the state was using Didier to represent current artistic trends in France. By this period, there was a decided interest in having better known French sites depicted in large-scale topographic panoramas. In this way, the French could advertise their parks and urban centers through paintings that were easily understood. 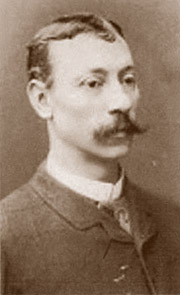 Didier also became a teacher taking on a number of students; in 1903 he was named a Chevalier de la Légion d’Honneur. He continued to exhibit until his death in May of 1914. By the end of his career Didier had established himself well with the Salon juries while receiving from the State man coveted commissions.